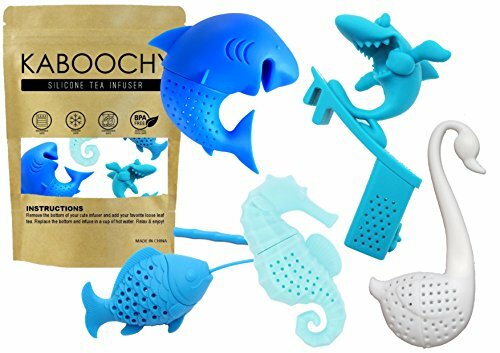 STEEP in the DEEP with this cute KABOOCHY Underwater World Tea Infuser Gift Set! It's perfect for the tea lover! A nice hot cup of tea is the perfect way to soothe and relax after a long day. And to add to your enjoyment, you can have these gorgeous little KABOOCHY Tea Infusers exploring into the vast depths of your tea cup! Add your favorite loose leaf tea in the infuser and let the rich flavor seep through the little holes from its body. It's the perfect gift for any Sea Animal or tea lover! This Value Pack includes a set of 5 of unique, funny infusers including a Fish, Seahorse, Swan, Shark as well as a Cool Surfing Shark! The infuser is constructed from non-toxic silicone, which is soft, food-safe and tasteless, so it won't affect the taste of your tea. Fill the tea infuser with loose leaf tea and it perches on the rim of your tea cup so you don't have to worry about fishing it out. It's dishwasher safe. Simply put it on the top-shelf or utensil basket for easy cleaning. It's microwave safe, so you can put it in the microwave to brew your tea. The perfect little gift for Tea Lovers! Each charming infuser will fit most mugs & cups. Wash with warm water before use. Simple packaging in an Environmentally Friendly Paper Bag - no unnecessary packaging to save the environment. CUTE & FUNCTIONAL novelty tea infusers. A nice hot cup of tea is the perfect way to soothe and relax after a long day. Let the KABOOCHY Underwater World Tea Infusers explore into the vast depths of your tea cup! This adorable gift set is perfect for your sea animal lover friends and family! GREAT VALUE - This awesome pack includes a set of 5 of unique, funny infusers including a Fish, Seahorse, Swan, Shark as well as a Cool Surfing Shark! The Underwater World Tea Infusers come in various shades of blue to please every ocean lover, surfer, and friend who loves fishing! Packaged in an environmentally friendly bag, it's an ideal gift for housewarming, retirement, birthday, wedding, or just to surprise the tea lover in your life. PREMIUM FOOD GRADE QUALITY - Rest assured that all KABOOCHY tea infusers are made with the Best Quality Food Grade, Non-Toxic Silicone which is FDA approved and BPA Free. They won't leave an aftertaste or unpleasant odor, so you can enjoy your healthy cuppa with our strainer. EASY TO USE - Our tea infusers will fit all different sizes mugs & cups. Just remove the infusers' bottom half, fill with your favorite loose leaf tea, replace the bottom, and perch it in a cup of hot water. Steep the infuser on your cup for as long as you require & lift it out! It will sure be a conversation starter for home or office. Optimal for medium to large leaf teas, not suitable for powdered tea or fine ground tea leaf. DISHWASHER & MICROWAVE SAFE - You can brew your favorite Jasmine, Oolong, English Breakfast, Early Grey or whatever tea you fancy by popping it in your microwave. To clean it, simply place it on the top shelf in your dishwasher for cleaning! Our eco-friendly, re-usable tea strainer ball eliminates tea bags and is so much better for the environment. If you have any questions about this product by KABOOCHY, contact us by completing and submitting the form below. If you are looking for a specif part number, please include it with your message.